Spring is supposed to be here, but even with (slightly) warmer temperatures, our house still loves a good soup. 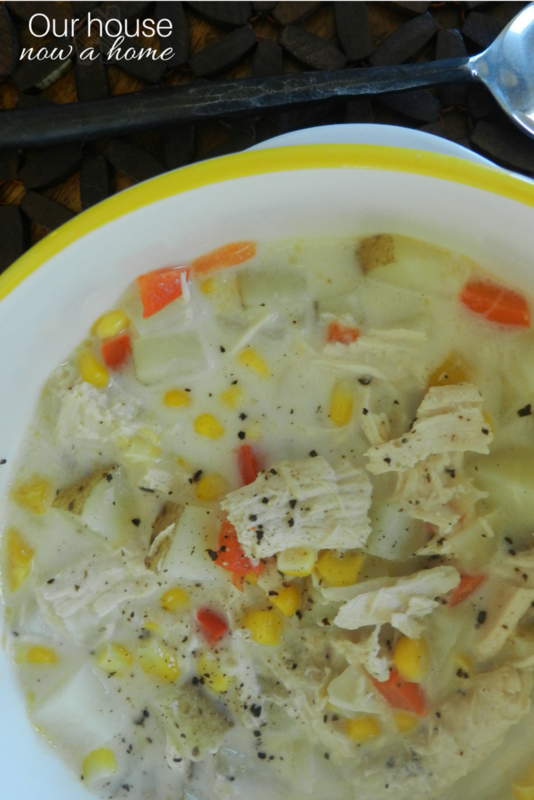 This recipe for Creamy Chicken Corn Chowder is really hearty and a win all around the table. I have ALWAYS made chicken and vegetable and chicken noodle soups. I’ve probably made them so much in the past that it could be the reason why my family started looking towards can soups for more variety. I’m not against the canned variety at all, but my poor chicken noodle was feeling abandoned, left in the dirt, not appreciated any longer! 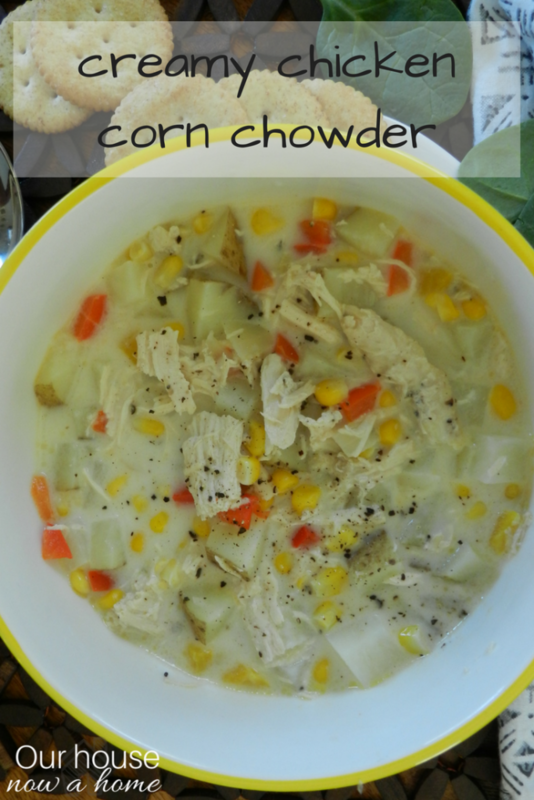 Things had to change when my husband got the kids a can of chicken corn chowder one day and they LOVED it. It was time for a soup makeover so maybe, just maybe, I wouldn’t hear these words again…”chicken again mom?!? !” or “oh, soup again” Oh, who am I kidding, I still hear that. So if the family likes chicken and corn in a chowder, then I will make it for them from scratch and see what turns out. Actually, the recipe is very simple (as is the norm for me) and it turned out great. I’m happy to say that people went to the pot for seconds and thirds. My husband likes a little “kick” as he puts it, in his food. Usually I try to spice things up a little bit for him while keeping it mild enough for the kiddos. The basic ingredients in this chowder calls for chicken, potatoes, corn and onions. I added some red pepper and jalapenos for a little extra color and kick. 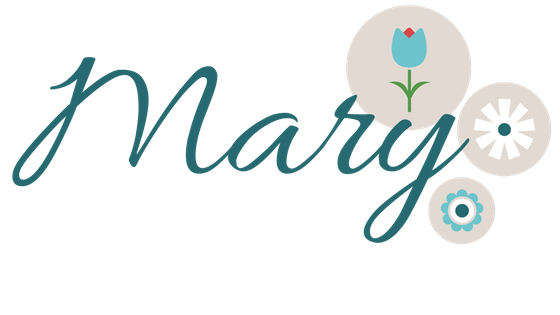 This recipe is very easy and the chowder itself is filling and delicious. I hope you try it today and maybe even put your own spin on it. 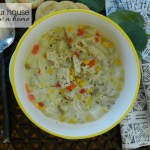 A very hearty and creamy recipe for Chicken and Corn Chowder. Cook chicken and shred or dice into cubes. Set aside. Note: I used my Crockpot to get the chicken prepared in advance. Melt butter in a large pan. Add onion, red pepper, yellow pepper, garlic and jalapeno. Cook in the pan until tender, about 4 minutes. Stir in about 1 cup of broth. Allow to come to a boil. Slowly mix in flour. After well mixed, slowly add remaining broth. Add potatoes and bring soup to a boil. Reduce heat and simmer for about 10 minutes or until potatoes are tender. Add corn, half and half, salt and chicken. Bring to a simmer again for about 10 minutes. Serve and enjoy. 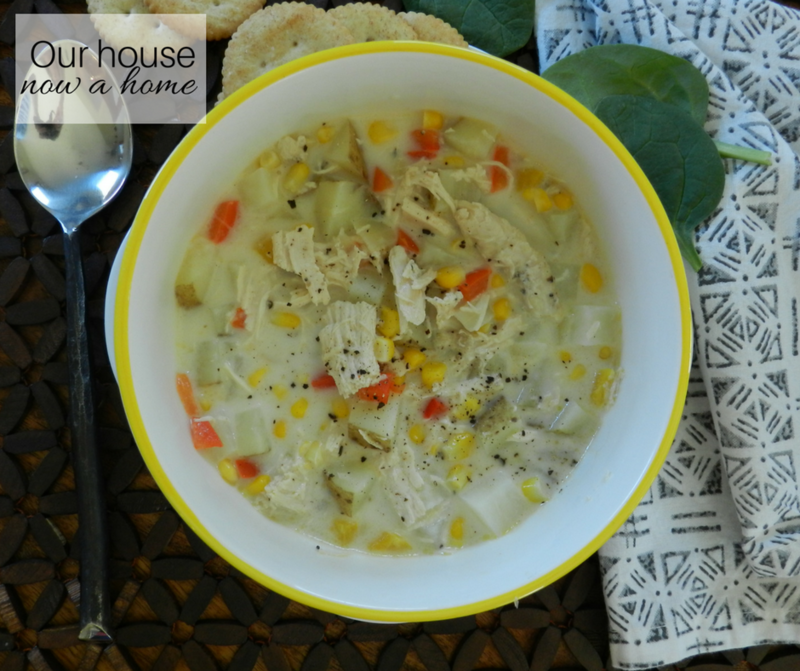 This Creamy Chicken Corn Chowder is looking delicious and easy to make. I love to try it.